Lucky Blue: Lucky Blue is opening for Phil Vassar! 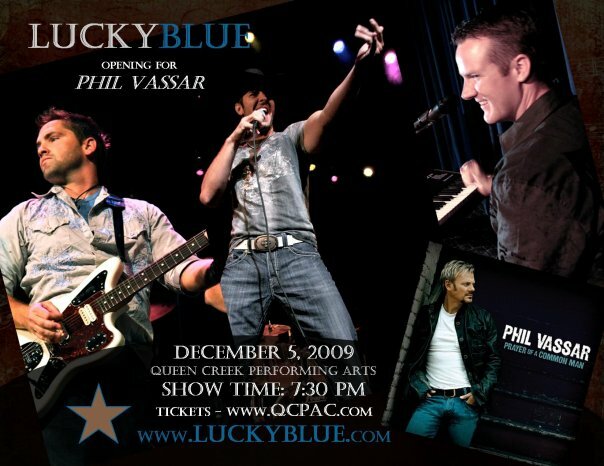 Don't miss out on this opportunity to see Lucky Blue and Phil Vassar performing live in this intimate setting. Those who best understand Phil Vassar - good-time, whirling-dervish-on-the-piano, hardest-working-man-in-country-music Phil Vassar - also understand the ongoing evolution of his mostly self-penned music. And Prayer Of A Common Man, his fourth studio album and first for Universal Records South, adds several more layers of artistic expression to his deepening repertoire.